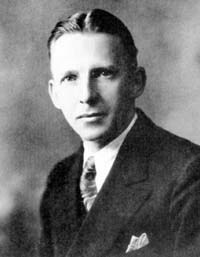 Back in the late 1920s, WLS in Chicago and WSM in Nashville seemed to have started a wave of new radio shows for entertaining folks, especially in the more rural areas. These were the early barn dance or jamboree type shows that were a 'live' variety show. While perhaps associated with hillbilly or country music and having a somewhat rural image, we've found that the variety of music and entertainment found on these shows is often very interesting. 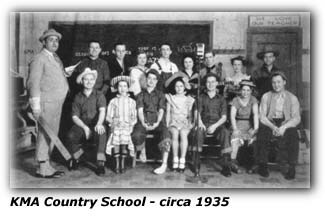 In Shenandoah, Iowa - just south and east of Omaha, Nebraska, Earl May had an idea for the live show that would become known as the KMA Country School back in 1928. The KMA Guide indicates he got his inspiration for the show from his own experiences while he was a school teacher in Nebraska. He placed the show in 'the little red schoolhouse' and almost from the start the show was a hit with fans. The early radio shows seemed to have their own themes. The WLS Barn Dance had the hayloft scenes - set perhaps as its name recalls - in a barn. 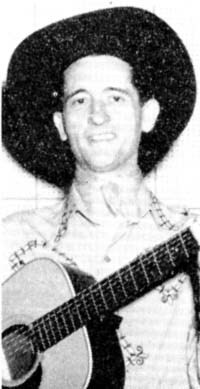 The early days of the WSM Grand Ole Opry were more of the traditional, rural, musicians, aiming for the attention of the more rural listener than the urban or city listener. At WHO, they patterned their show after a fictional town setting. And in Shenandoah, Iowa over KMA, the show revolved around a ficitional country school. The announcers were the 'teachers'. 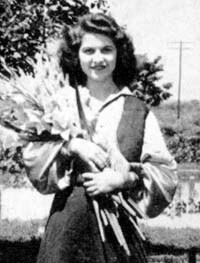 The show was said to have had over 1,000,000 visitors to see the show in person in Shenandoah and/or Council Bluffs. On top of that, hundreds of thousands more were able to see the show in person when the cast made their personal appearances. 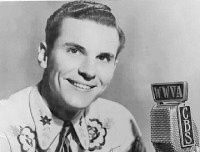 In fact, its popularity was such that as much as Earl May would include his memories into the show, it inspired listeners to send in their own humorous experiences in a country school that became a part of the show and helped make it popular in the Middle West. Perhaps showing its popularity with radio listeners, the KMA Guide mentions the cast received "...thousands of cards and letters...every year." 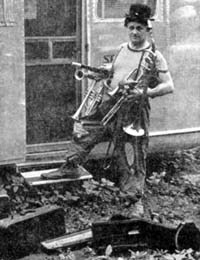 some of the early performers on that show included such acts as The Shumates - a group of four brothers who also played various brass instruments such as the saxophone. The brothers were Raymond, Paul, Lewis and Don Shumate, all natives of Missouri. On the KMA Country School show, listeners knew them as Strizzie, Henry, Isaac and Ole. Another early group on the show was Harness Bill and the Harness Makers. Now, it appears in reality there was no "Harness Bill" - that was the sponsor. But the Harness Makers - that was Frank "Pete" Peterson, Gus Swanson and Fritz Carlson, who played the piano for the group. There was the Dixie Girls, too - Opal Dixie and Alta Dixie. One played the guitar, while the other played the Hawaiian guitar. Another duo was Gretta Bellamy and Cousin Paul Crutchfield. They sang together, and as they did, Gretta played the piano accompaniment. She also played the pipe organ and also on occasion would sing "...those old crooning songs". Cousin Paul also did duty as an announcer. But by 1950, was living in Decatur, Georgia. Another group that waws a part of the KMA scene was known as the Jig and Reel Orchestra, not your usual collection of musicians. They were termed an "Old Time Dance Orchestra". The KMA Guide takes pains to point out that the "...members were real musicians and while they played any kind of music desired, they devoted most of their time to 'old time' music because of popular demand." The orchestra did extra duty it seems, too. 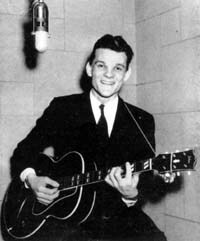 For Earl May would often use them to help him during one of his lengthy sales pitches on his company's products - broadcasting into the night about all of the items for sale and the band was there, too. In 1935, we learned that the show was being held at the Mayfair Auditorium. Toby Stewart was handling the role of 'teacher' on the show. 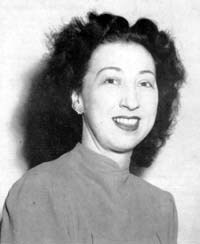 The cast of entertainers included some of the names that were there at the start, The Shumates, Gretta Bellamy. Other names mentioned were Faylon Geist, Mickey Gibbons, Bill Alexander, Edith Jennings, Frank Jennings, Twylia Danielson, Kay Stewart, Lindy Stewart, Paul Greenlee and Jerry Smith. School District No. 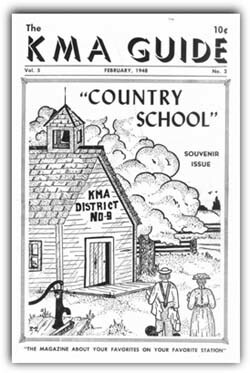 9, where the fictional KMA Country School was located became a hit in the listening area of KMA and also national reknown being one of the first audience participation shows on the air. The February 1948 KMA Guide tells us that the show's ringing of the school bell was the start of the show and the "...signal for the whole family to gather around the radio and listen intently." The show had the usual change in cast over the years as artists came and went. But through it all, it carried a bit of Edward May's vision. It had "down-to-earth entertainment" - which included not just music, but jokes, locally scripted plays, contests of just about any type and of course, songs and music to go along with whatever fun the 'school kids' might come up with while 'class' was in session. 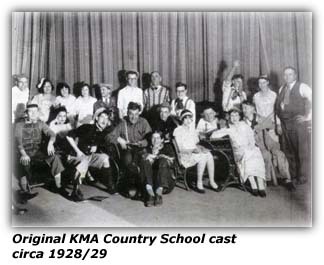 But when World War II broke out, the KMA Country School was affected like many similar shows during that era. Travel was curtailed. Personnel was lost due to military commitments. So, during that time, the KMA Country School left the air. 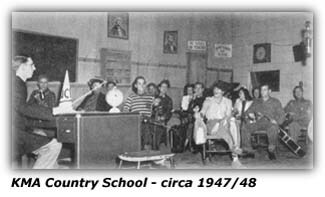 Then came December 6, 1947 and the school bell was once again heard to let radio fans know that the KMA Country School was back on the air. However, the show took on a different air during this new stint. The show was aired over KMA on Saturday afternoons from Shenandoah at 2:30pm. Then on Saturday evenings, the cast would peform from Council Bluffs, Iowa - just over the river from Omaha, Nebraska. Before the show resumed, KMA tried another live type show for a couple of months it seems. There was the Cornbelt Jamboree for a time. But perhaps the concept of the Country School was still what the fans wanted to hear. 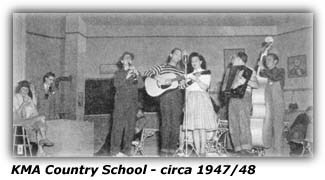 The new cast of the Country School show included the current KMA stars them, Elmer Axelbender, Zeke Williams, Joan WIlliams, Jeanie Pierson, Mack Sanders, Merl Douglas, Harpo Richardson, Ike Everly (father of the Everly brothers), Wayne Van Horn, Steve Wooden. The 'teacher' was Glenn Harris and the show's scripts were penned by Max Olive.